Last weekend my father-in-law called me and was heading up to Ball Ground GA to pick up some pork chops. My immediate thought was that it was a long way to drive for some pork chops. He proceeded to tell me how incredible they were and that they were like nothing I’d ever had before. I told him to pick up 5 for me knowing that if they were as good as he said, I would need to do some sharing. 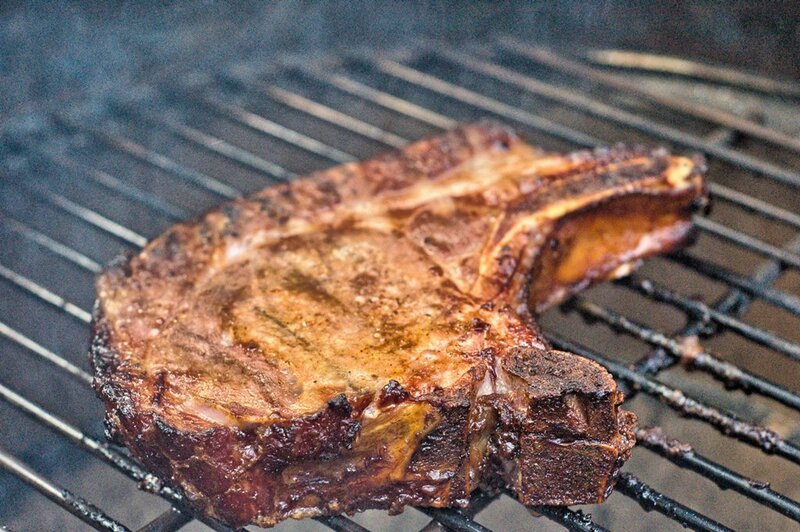 Boy am I glad, this smoked pork chop is the real deal. I did a little research and the smoked pork chops came from a store called Frankfurt Doner and Meats, located at 250 Gilmer Ferry Rd in Ball Ground GA. You can connect with them on facebook here http://www.facebook.com/pages/Frankfurt-D%C3%B6ner-and-Meats/180573851984559. It came off the grill almost falling off the bone. It was very tender with an amazing flavor. The chops are already smoked so they don’t require much time on the grill. I split the pork chop with my kids, complemented with some green beans and a Dogfish Head 90-minute Imperial IPA. Here are some pictures of the preparation and end result. Man, it was really good. still have 3 left and am trying to ration them over time. Appreciate the comment.